Teenagers--and particularly middle schoolers--have a knack for asking the hard questions. As parents, grandparents, or teachers, we may even struggle with exactly how to answer in a way that is biblical, gentle, and clear. Author, professor, and pastor Joel Beeke speaks directly to this young audience in his book, Tough Questions about the Bible. Writing from a perspective teens can relate to, he responds to 68 commonly asked questions from young people. Presented in an easy-to-read, Q&A format, the book is divided into nine sections that include tough questions about the Bible, sin and sadness, God, Christ, salvation, doing what’s right, prayer and worship, other religions, and about hope and eternity. In a culture that advocates that everyone should be free to form their own truth, we must answer our kids’ tough questions in the light of God’s Word. Beeke has taken real questions from students in real life situations–and, as a real pastor with a genuine concern for their souls, he points them to the one true God and the real Gospel. Tough Questions about the Bible is highly recommended independent reading for your middle-school aged or older teen. 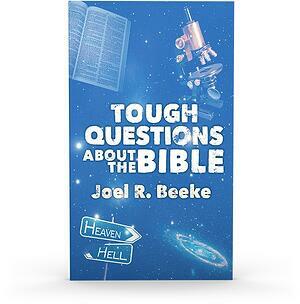 Purchase a copy of "Tough Questions about the Bible"